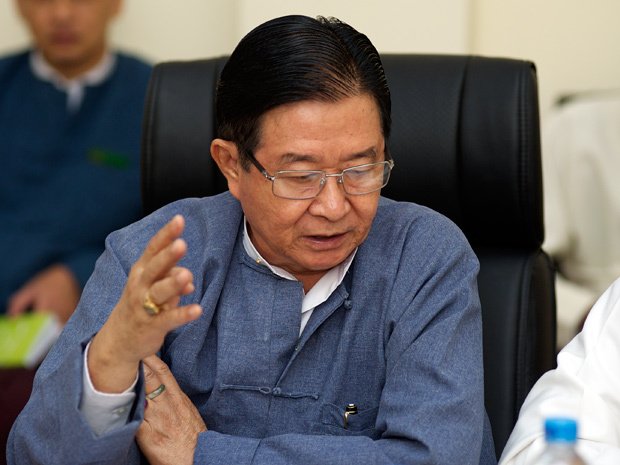 Earlier in the visit, the Elders met with Thura Shwe Mann (Speaker of the Parliament). This was the Elders’ first meeting with him. 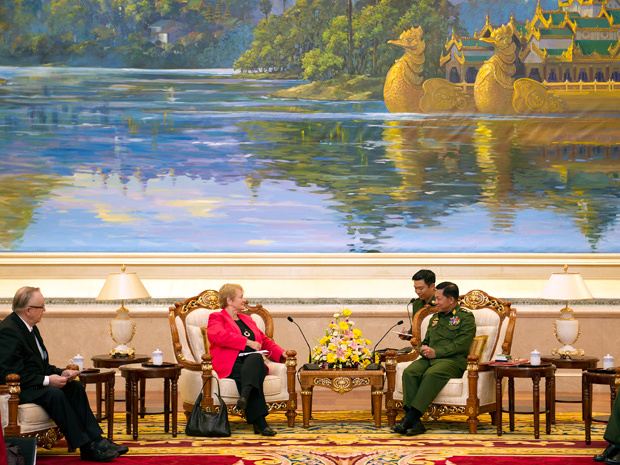 During their conversation, he emphasised that any amendment to Myanmar’s constitution should be made in the national interest, and highlighted the urgency of reaching a nationwide ceasefire to alleviate the suffering caused by the conflict. 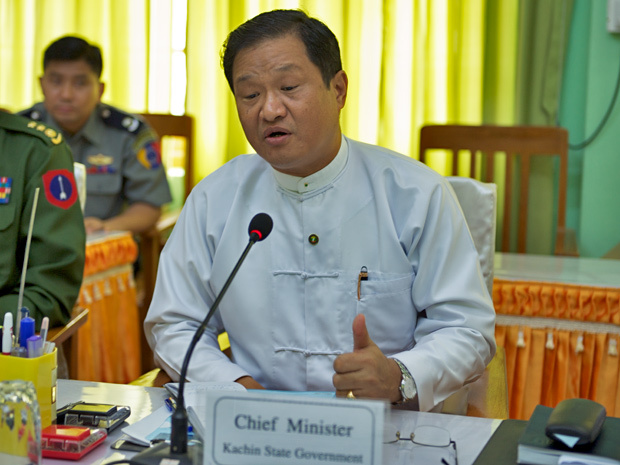 During a discussion with U Aung Min – the minister in charge of the peace process, whom the Elders also met on their previous visit – the government’s lead negotiator highlighted the Tatmadaw’s commitment to the latest ceasefire discussions as an encouraging sign that a comprehensive agreement could be reached. From Nay Pyi Taw the Elders travelled north to Myitkyina, capital of Kachin State, where fighting continues between the Tatmadaw and the Kachin Independence Army. 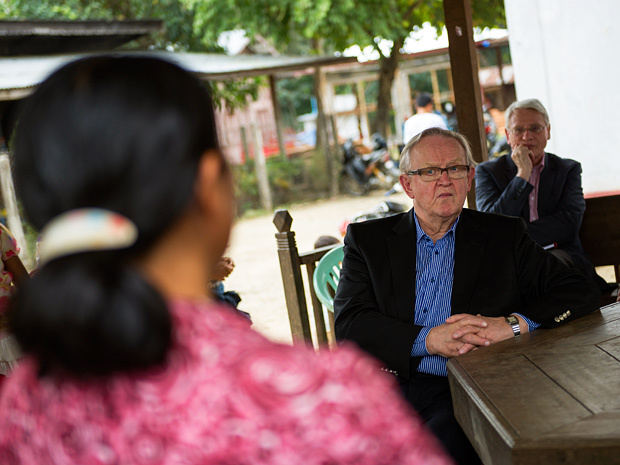 At a camp for people displaced by the long-standing conflict, set up in the grounds of a Baptist church, the Elders sat down with the camp’s residents to hear about the conditions under which they were prepared to return to their home villages. The Elders were received by Kachin State Chief Minister La John Ngan Sai, from the ruling USDP Party, and the Kachin State cabinet. The Chief Minister told the Elders that that his administration’s priority was to pursue economic development and maintain stability. He emphasised that these two objectives go hand in hand. 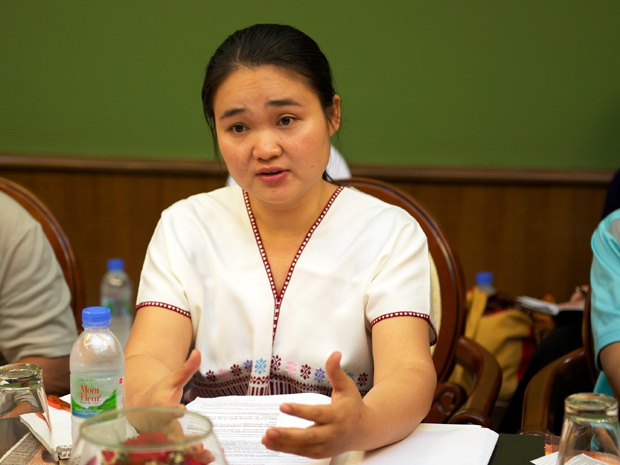 In Myitkyina the Elders also heard from a range of civil society groups including the Kachin Women Union, a group of students and local elders. 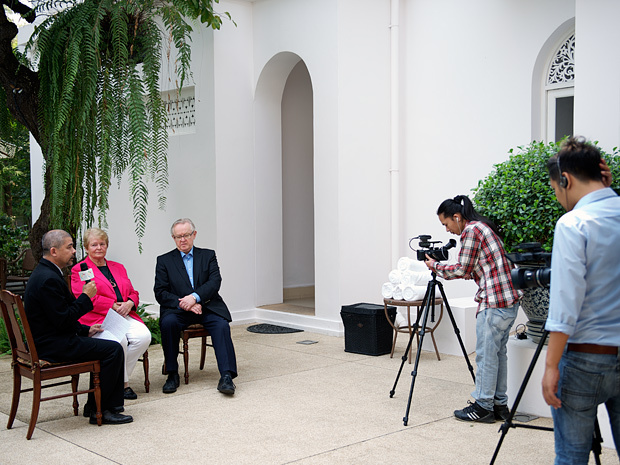 They expressed a range of concerns about the authorities’ historic treatment of the Kachin people. Citing inadequacies in the design of the nationwide census, difficulties encountered in reaching a ceasefire and the situation faced by internally displaced persons (IDPs), these groups generally expressed a feeling of mistrust towards the government and the Tatmadaw. 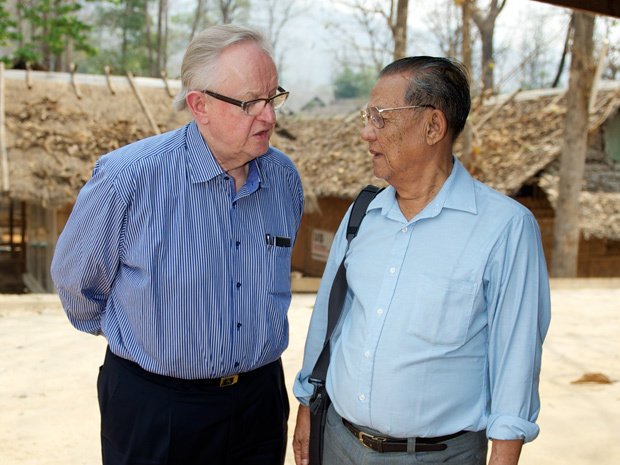 After their meetings in Myitkyina, the Elders travelled onward to the Thai side of the Myanmar-Thailand border. They went to Mae La, a refugee camp established in 1984 to support mostly Karen populations fleeing conflict and discrimination inside Myanmar. The camp hosts more than 40,000 refugees today. Pastor Robert, who leads the Karen Refugee Committee, described the uncertainty felt by camp residents who face the prospect of one day returning to Myanmar. These refugees feel that they lack adequate information about the situation and opportunities available to them in the country. 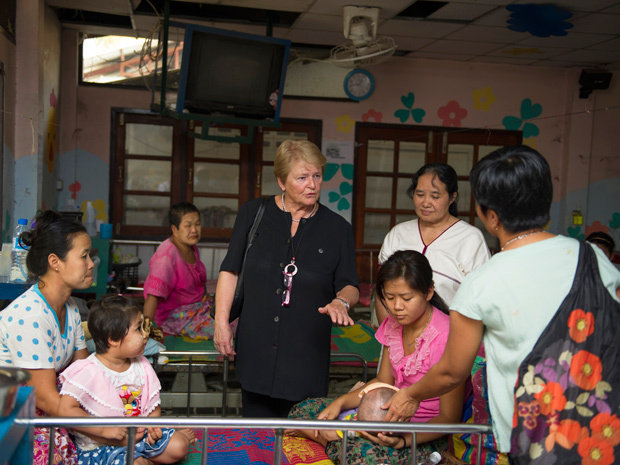 Many of the younger residents have lived in Mae La most of their lives, or were born in the camp. 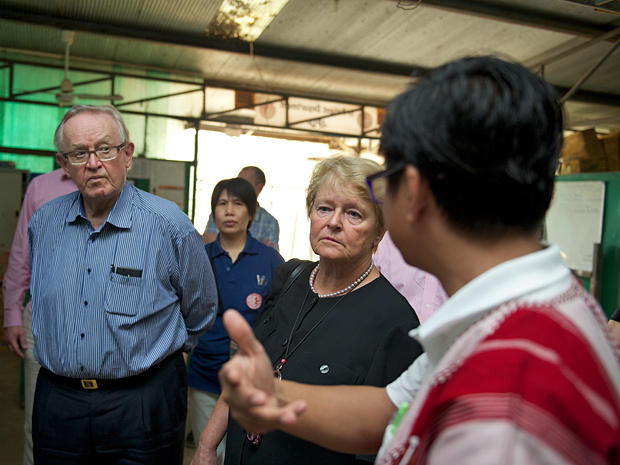 In Mae Sot the Elders also met with Karen civil society organisations including the Karen Women’s Organization, Karen Department of Health and Welfare, Committee for Internally Displaced Karen People, Karen Education Department, Karen Youth Organization, and Karen Human Rights Group. 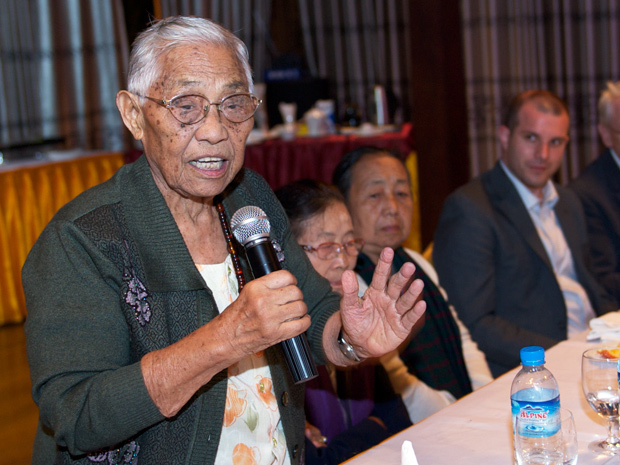 In this photo, K’nyaw Paw, General Secretary of the Karen Women’s Organization, speaks to the Elders. They described their concerns over Myanmar’s large-scale development projects, in Karen State and elsewhere, especially their worry that these initiatives are moving faster than the peace process. They stressed that responsible development requires political reform and consultation with the local populations. 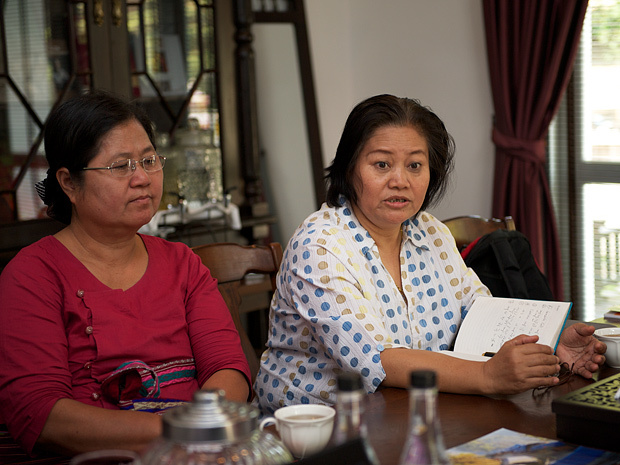 In Chiang Mai, Thailand, the Elders met members of the Women’s League of Burma to discuss the importance of women’s participation in the peace process. They feel excluded from peace negotiations, insofar as discussions have focused on the nationwide ceasefire and involved only senior male cadres from the government, army and ethnic armed groups. They highlighted that women have suffered most from the conflict and have a crucial role to play in helping to build long-term peace in the country. The Elders also met with representatives of the United Nationalities Federal Council (UNFC) – an umbrella body for the different ethnic armed groups. 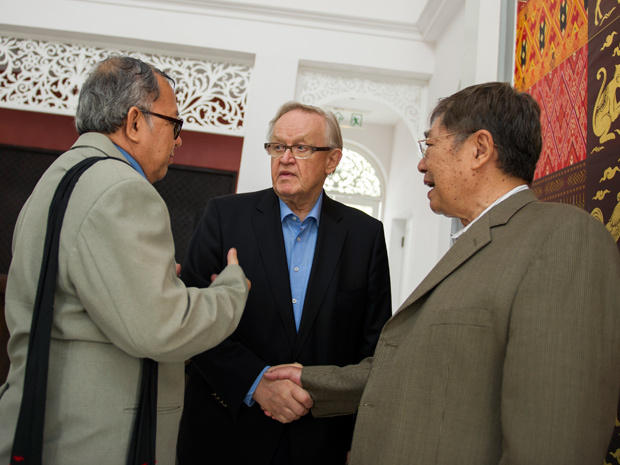 In this picture, Martti Ahtisaari is seen speaking to Col. Hkun Okker (Chairman, Pa-o National Liberation Organization) and David Tharckabaw (Vice-President, Karen National Union). The UNFC representatives expressed cautious optimism mixed with historic reservations about the ceasefire process. They were pleased that all parties had agreed to work on the same version of the ceasefire proposal rather than promoting different texts. They were keen to move quickly to the next stage, a national political dialogue on future constitutional arrangements in Myanmar, after the planned national ceasefire accord.